It hasn’t even been a year since Guardians of the Galaxy hit theaters, but excitement for Guardians of the Galaxy 2 is high nonetheless. With it being over two years away from release, details have been scarce, but at minimum we can expect to see Peter Quill, Gamora, Drax the Destroyer, Groot and Rocket causing all kinds of intergalactic mischief. Now it’s been announced that the blue-skinned assassin Nebula will be another character returning for the highly anticipated sequel. On Wednesday during a Q&A on the live-streaming app Periscope (via Flickering Myth), director James Gunn reaffirmed that we would see Karen Gillan reprising her role as Nebula for Guardians of the Galaxy 2. Aside from the main characters, Nebula is the only character that’s been confirmed to return. Guardians of the Galaxy 2 will also introduce several new characters, including James Gunn’s favorite superhero, but fans shouldn’t expect to see the first film’s main antagonist Ronan return. Gunn also mentioned during the live-stream that he has turned in his treatment to Marvel, and will begin work on the screenplay next week. He has already made significant progress on the script itself, completing "over 70 pages" of the first draft. Nebula was introduced in Guardians of the Galaxy as Gamora’s adopted sister who also served their "father" Thanos. After Gamora joined with the Guardians, Nebula joined forces with Ronan when he took the Power Orb for himself so she could see Thanos be killed (who had inflicted untold amounts of pain and torture on her). 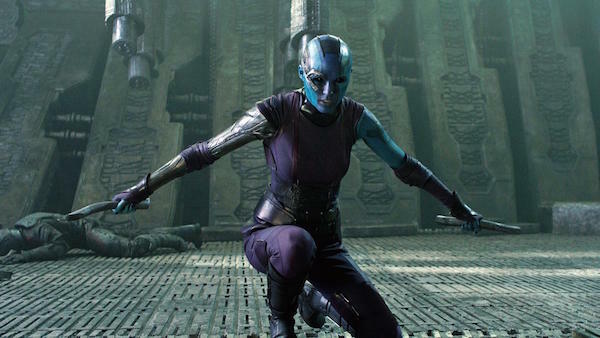 While Korath was killed by Drax the Destroyer and Ronan was obliterated by the Power Orb, Nebula was able to escape the battle of Xandar when she hijacked a passing ship in an effort to escape Gamora and flew off to parts unknown. It’s unclear how Nebula will fit into Guardians of the Galaxy 2’s storyline, but we can at least expect her bitter rivalry with Gamora to be touched upon. One thing the first movie didn’t delve too deeply into was what their childhood together was like, although one can reasonably assume when you’re being raised by the Mad Titan, it’s no picnic. Perhaps if/when she crosses paths with Gamora and her gang of cohorts in the sequel, this could be elaborated upon amidst the main storyline. Guardians of the Galaxy 2 will be released in theaters on May 5, 2017.